SDBC discount code - SDBC18 is good for 15% off registration. 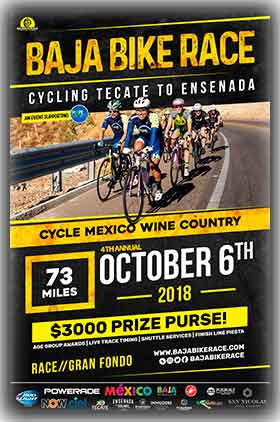 Baja Bike Race is a 73 mile race and gran fondo taking you on a journey through the Valle de Guadalupe, Mexico's wine country! You start 4 blocks from the border of the United States in the magical town of Tecate and finish in the coastal city of Ensenada. The Tecate to Ensenada route has history taking you back to 1969 and ended in 1993. We brought back this amazing route in 2015 because this is something not to be missed. During your ride, you will experience just over 4000 feet of climbing with gorgeous scenery!